If one listened closely Sunday night in Bobby Dodd Stadium, they could hear chants of “Sting Em’!” after every goal kick. No, it was not a football game on The Flats, but rather Atlanta United’s first game. 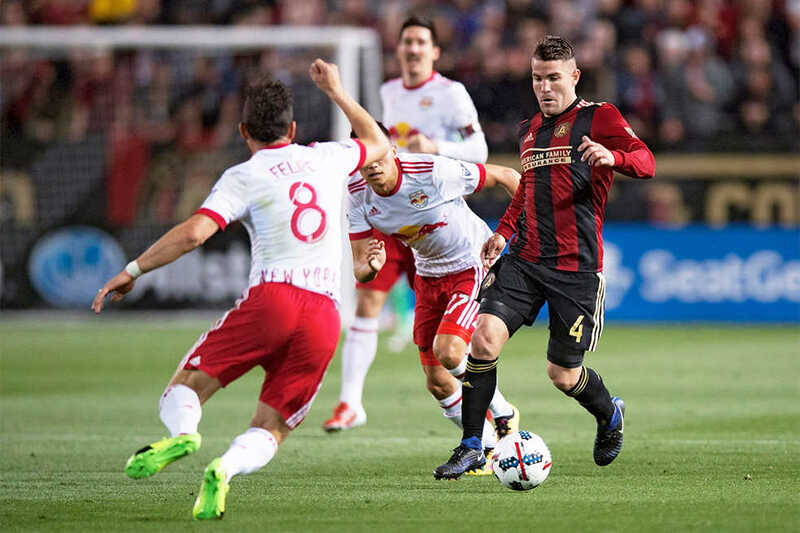 In front of a sellout crowd of over 55,000, Atlanta’s Major League Soccer franchise played the first of eight games that will be held at Tech until Mercedes-Benz Stadium finishes its construction in late July. Against the highly-touted New York Red Bulls, Atlanta jumped out to a quick 1-0 lead courtesy of a beautiful goal by 23-year-old Argentine national Yamil Asad. He was able to finish a great ball sent into the box by Tyrone Mears and beat Red Bulls goalkeeper Luis Robles. Atlanta United’s manager, Gerardo ‘Tata’ Martino, formerly of FC Barcelona, is known for fielding teams that attack aggressively. With three talented designated players leading the attack in Miguel Almiron, Josef Martinez and Hector Villalba, Atlanta United put an immense bout of pressure on Robles. If not for a great save at the end of the first half on a shot by Martinez, it could have been 2-0 going into halftime. The atmosphere in general at and around Bobby Dodd Stadium was outstanding. Beginning over five hours before kickoff, a fan village was set up with a live DJ and many corporate tailgates. By 7 p.m., Callaway Plaza was completely packed and there was barely any room on Freshman Hill. Anyone in the vicinity of East Campus on Sunday would have certainly noticed the scene. Enthusiastic fans, many of whom were accustomed to following teams located thousands of miles away, shouted jubilant chants as they waited to enter the gates. As for Bobby Dodd Stadium, it was legitimately a full house. Atlanta United has already sold over 30,000 season tickets, which is the most for an expansion team in the MLS. Empty seats were few and far between, and fans were standing for virtually the entire match. The rowdiest fans resided in the north end of the stadium in the area where the student section can be found during football games. The chants were lively, and fans provided an atmosphere that is usually only found in European soccer stadiums. Tech students were out in full force among the Atlanta United supporters. Along with the “Sting Em’!” chants, a Tech flag was flown high alongside the Atlanta United flag in the northern end of the stadium. As Grant Field hosted professional soccer for the first time, the conditions were pristine. Arguably the only complaint was that the field was too narrow. There was only two yards of space between the pitch and the stands. Football fields are narrower than soccer pitches, so this was expected going into the match. Players were able to work around this issue simply by running along the goal lines. The commissioner of Major League Soccer, Don Garber, was in attendance, and he views Bobby Dodd Stadium as a perfectly capable host for MLS games. Atlanta United will play its next match this Sunday against another expansion team, Minnesota United. They will return on March 18th for a contest against Chicago Fire. Atlanta United will also play D.C. United, Houston Dynamo, New York City FC, Columbus Crew, Colorado Rapids and San Jose Earthquakes in Bobby Dodd Stadium over the next four months. As Atlanta United players continue to improve as a collective and fan support continues to match the intensity shown in the first match, this expansion team may quickly overcome its learning curve and rise as a contender. All too often, Atlanta fans have been reluctant to demonstrate a show of support barring incredible runs. The loud chants, exciting atmosphere and electricity on Sunday may be a wind of change. Add patient ownership, a promising roster and an experienced coach, and the result is optimism.